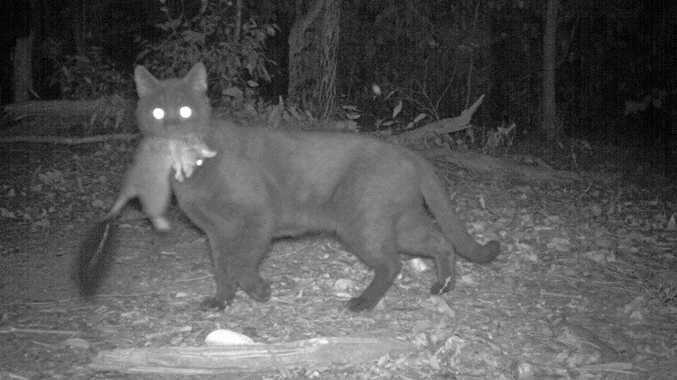 CLAWS are out over a divisive call to cull Central Queensland's feral cats. Within seconds of sharing news of the $10 price tag the Banana Shire has put on cat scalps, battle lines were drawn between the region's cat lovers and haters. More than 1000 readers have voted in The Morning Bulletin's online poll, with the majority are in favour of the cull; 54% of the total 1081 voters as of 3.20pm. Of those, 29% (322 people) believe the $10 bounty should be higher. Closely behind them are the "there must be a better way" believers, making up 43% of voters (467 people). Get your vote in below, even if you are the 1% of people who didn't care before and "don't care now". Do you think putting a bounty on feral cats is the right solution? This poll ended on 20 October 2017. The council has allocated $25,000 in its Land Protection budget to cover the cost of the bounty and will continue the program until this funding is exhausted. Their decision has opened up discussion on where to draw the line, with some commentators outraged cats will pay the ultimate price for their owners' decisions. Lindsay Lakin: If people looked after their cats we wouldn't be in this position where they are pest and destroying all other wildlife it's unfair on the other wildlife they are killing every day. Kimberley Wheeler: This is disgusting any jo blo will just find a cat (domestic or not) and get the money why don't they fund desexing instead? Teaghan Smith: Oh that's going to end up like every other time it's been tried across the country. People trap pet cats on their lawns, kill them for the money. Good job. Apparently nothing has been learnt from the past. Pete Torrisi wonders though, why cap the bounty at cats? "This is a great idea and should be rolled out all over regional Australia," he commented. "The bounty should be widened to foxes and cane toads." Leonard Craker: Bout time they kill about 1 million natives a week. Lachlan Jarrett: This is a great move taken to preserve our native wildlife. Take the bounty away and it is still a great initiative to support the culling of a feral pest. I hope other councils take this action on board. Bounty or not I'm still going to do my best to cull the numbers where I live. Scott Frost: About time something gets done about the cats everywhere. Now all the councils need to do is enforce registration, desexing and breeding like they do with dogs. Chloé Taylor: Are you serious????? I'm not a cat lover but that's just insane.. I'm hoping that's only feral cats??? But put them down humanely thats digusting!!! so many domestic ones get out too.. the council disgust me yet again to their treatment of animals..
Susan Curtis: Yes it is sad and disgusting they would even suggest it animal cruelty.